Fearless women like Marilla Ricker fought the status quo and launched women to the heights of the political and legal worlds in New Hampshire. When you walk the halls of the NH Statehouse, you’re surrounded by row upon row of impressive, gilt-framed portraits. Of the 200 or so, almost all are men. Just eight are women. Marilla Ricker, who ran for governor before women even had the vote, is one of them. Learn more about Ricker, who was the first woman admitted to the bar in New Hampshire. It is a tableau that tells the story of the struggle for women’s rights, for a place in politics, in governing, during the past two centuries in New Hampshire. But it only goes so far. What you don’t see is the fight against those who believed that women serving in office would mean they might neglect life at home and, as one man long ago put it, “burn the biscuits.” More importantly, they believed women weren’t capable of handling the weighty matters of civic life. More than 200 portraits of people important in NH history hang in the halls of the Statehouse. Only eight are of women. Today there are still skirmishes in the fight — one of them, ironically, about women’s portraits on the Statehouse walls, either not hanging them or placing a potted plant in front of one that does hang — but there’s little doubt that women have succeeded beyond all expectation. Stand beneath the portrait of, say, the gray-bearded Onslow Stearns, who was governor just as the suffrage movement was picking up steam in 1869, and imagine what he would think of this: a woman executive councilor, a woman house speaker, a woman senate president, a woman governor, a woman attorney general, a woman supreme court chief justice, a woman house speaker, senate president and governor at the same time, a majority woman state senate, and an entire congressional delegation of women. All of that has happened in the last 40 years — it didn’t take anywhere near the “several centuries” that Marilla Ricker feared it would. The deluge of coverage came because, that year, New Hampshire became the first in history — US history — to have an all-woman congressional delegation. In the fall elections, Ann McLane Kuster and Carol Shea-Porter — who was the first woman to be elected to national office from New Hampshire, in 2006 — filled the state’s two House seats that had been held by men, with Shea-Porter regaining the seat she had previously held. They joined sitting senators Jeanne Shaheen — who had been the state’s first woman governor and first woman US Senator, and first woman in US history to be elected both governor and senator — and Kelly Ayotte — who had been the state’s first woman attorney general and first woman Republican senator. To understand what a political triumph that was, note that at the time 16 states, including progressive New Jersey, had no women in Congress. Four states had never elected a woman to either the House or the Senate. Add to that, another woman, Maggie Hassan, had been elected governor. Four years later, she would join the congressional delegation as senator. With Shea-Porter being elected again after a hiatus of two years, that produced another first in US history — an all-woman, all-Democratic delegation. The women, proud to a person of the historic achievement, believe it’s not only good for women, it’s good for the country. Why did it happen? 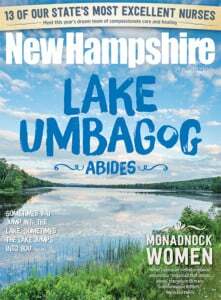 What is it about New Hampshire that engendered those “firsts”? Those are questions that everyone, including Levesque, seems to have a ready answer for: It’s the size of the Legislature, one of the largest in the world. Marilla Ricker tries to vote even though women didn’t have the right to. She would continue to try to cast her ballot in elections for the next 50 years. After being refused admittance to the bar, Ricker successfully petitions the NH Supreme Court for the right to be admitted. The high court concurs. The 19th Amendment is ratified and women vote for the first time. Jessie Doe and Mary Louise Farnum are elected to NH House. Maude Ferguson wins a seat in the NH Senate a decade after women are elected to the NH House. Dudley Dudley becomes the first woman appointed to the Executive Council and the first to serve in an office higher than the Legislature. The first woman NH Senate president, Vesta Roy, becomes the first woman acting governor when Gov. Gallen becomes ill.
Arnie Arnesen becomes our first woman nominee of a major political party. Jeanne Shaheen, first woman governor; Donna Sytek, first house speaker. The first woman NH Supreme Court justice, Linda Dalianis, is appointed. Kelly Ayotte is appointed NH’s first woman attorney general. The first NH woman to serve in national office, Carol Shea-Porter, wins election. Jeanne Shaheen becomes the first NH woman elected to the US Senate. Linda Dalianis is appointed chief justice of the NH Supreme Court. A first in US history ­— women comprise an entire delegation. “The 400-member House is designed to be very close to the people,” Levesque says. “Each legislator has few constituents.” Just 3,000 or so, in fact. That closeness and the sheer number of seats create many opportunities for women who are serving in local offices or on boards to take the next step to the Legislature. The fact that a lot of the work done by women on the political periphery is volunteer helps too. It makes for an easier transition to the Legislature, which is essentially volunteer. The pay is $100 a year and mileage. Another factor that favors women — it’s not a full-time job as it is in some other states. That allows women to more easily participate while they’re raising a family. In 1984, Arnie Arnesen, just elected as state representative, broke new legislative ground by taking her newborn baby to the Statehouse. “I gave birth about a week before the election,” she says. “We, the baby and I, were sworn in together, and I breastfed on the floor of the House for the first year.” The in-House breastfeeding made news across the country. “I felt like, by other women seeing me with a baby as a legislator, it was a welcome mat, that it was OK. It made an impression,” she says. It’s not a question that likely would be asked of a man, but it was, and sometimes still is, asked of women. She ran again in 2008 and won. Today she serves on both the Senate Foreign Relations and Senate Armed Services committees. No doubt role models like that — and time — will normalize the role of women in politics. Generations coming up will think nothing of it, the discrimination washed away by years of women performing in politics as well as — perhaps better than — men. Many pioneering women have acted as mentors in New Hampshire, but cited most often are Jeanne Shaheen; the late Susan McLane, the mother of Rep. Kuster, who served in both the NH House and Senate, and made a run for Congress in 1980; the first woman executive councilor Dudley Dudley and the first woman house speaker Donna Sytek. Long before — and after — Sen. Blair’s failed effort to extend suffrage, Marilla Ricker tried to vote in her hometown of Dover. She demanded a ballot, unsuccessfully, in 1870, and continued to do so, unsuccessfully, for the next 50 years. In 1910, at age 70, she tried to run for governor, but her filing papers were refused. Many New Hampshire women were active in the suffrage movement, working for decades to get the right to vote. In 1917, suffragists marched in New York City. “That’s the state’s first example of a woman trying to run for office,” says Liz Tentarelli, president of the League of Women Voters, which is a direct descendant of the National American Woman Suffrage Association. “Marilla was denied because she wasn’t a registered voter. Still, she got six votes.” Six votes that came from supportive men. In November 1920, a few months after the 19th amendment was ratified (New Hampshire was the 16th state to ratify) and just 10 days after the first election where women could vote, Ricker died. It’s not clear whether she had voted in that long-sought election. It’s likely that she was too ill to get to the polls. But in that election, two women — Dr. Mary Louise Farnum of Boscawen and Jessie Doe of Rollinsford — won seats in the NH House. And, they did it on a write-in vote. Ratification had happened too late for them to file for office. News reports said women’s turnout was “large and enthusiastic throughout the state.” It would be another decade before a woman — Maude Ferguson of Bristol — was elected to the NH Senate. The poem was recently removed after the media caught wind of it. Two other issues were also recently resolved, again after creating a stir in the media. The potted plant that had been placed in front of the portrait of Jeanne Shaheen — no doubt an inspiration to schoolgirls and others touring the Statehouse — was removed. And the long-lingering portrait of the first woman executive councilor Dudley Dudley was finally approved for placement on the wall. Also in recent months, the national “Me Too” discussion about sexual harassment filtered down to the Legislature. Media reports suggest there’s more work to be done despite the progress of women in state elective office. But none of that dampens the optimism that there’s a seismic shift underway, or soon could be, for women in the political world. There are unprecedented numbers of women running for office in 2018, and that’s likely to happen again in 2020. Not only was New Hampshire’s Marilla Ricker a fierce fighter for women’s rights in the world of politics, she also took on the legal establishment of the mid-1800s. Back then, law was strictly a profession for men. Ricker was having none of it. In 1882, she passed the bar exam in Washington, DC, reportedly outranking the 18 men who took the exam with her. She practiced law there for many years, and was one of the first women to be admitted to practice before the US Supreme Court. When she returned to New Hampshire in 1890, she became the first woman to apply for admission to the New Hampshire Bar. After being denied, she petitioned the NH Supreme Court for the right to practice law. All of the justices concurred, giving women the same rights as men. Dalianis, appointed as justice in 2000 and chief justice in 2010, did not face the daunting obstacles that Ricker had in her legal career, but there were still obstacles. The main one — a woman being a judge in New Hampshire was, as Dalianis says, “unheard of” when she started out in the 1970s. Even being an attorney was unusual for a woman. In 1977, statistics show that the NH Bar Association had only accepted 100 woman attorneys in the previous 60 years. In 2018, women comprise about 37 percent of all active attorneys. And woman judges are no longer uncommon. One of those who have proven themselves is Kelly Ayotte, not just the first woman Republican US Senator and part of the first all-woman congressional delegation, but the state’s first woman attorney general. She became chief of the homicide prosecution unit, legal counsel to Gov. Craig Benson and deputy attorney general. In 2004, she was appointed attorney general, serving for five years. OK, so women in New Hampshire are shattering all kinds of glass ceilings, scoring one political victory after the other. But what about the presidency? When will a woman be the Leader of the Free World? “That’s the $54 million question,” says Dr. Elizabeth Ossoff, an expert in political behavior. It’s one of the questions she’s been studying for years as professor and psychology department chair at St. Anselm College, and at the NH Institute of Politics. “I try to understand behaviors and motivations about why people make the choices they do when it comes to all things political,” she says. Ossoff got a lot more data points in the last presidential election, the first between a man and a woman, and in the earlier election with a woman running for vice president. A few noted during the campaigns — Sarah Palin’s attractiveness and spending on her wardrobe, and Hillary Clinton’s pantsuits and her voice that, to some, became “shrill” when she raised it. Once gender becomes part of the equation, unconscious expectations come into play, Ossoff says, expectations that are rooted in the traditional roles played by men and women: “People tend to be more comfortable with the paternalistic model, where a man is in charge.” That, she adds, is particularly true of the presidency, which is viewed differently than other elected offices. No doubt gender and race will become less of an issue as time goes on, but it may take a while. “You can’t think that, because Obama won one time, it’s over. It needs to happen a number of times before it becomes normal, not just an exception to the rule,” Ossoff says. Even in New Hampshire, where a woman in high office is not an exception to the rule, Clinton won the state by just .3 of a point. But it’s not easy, she adds. “People don’t want to admit they’re been bigoted in this way because it’s a negative reflection on their sense of self.” And that, in turn, can set up resistance to changing; people want to protect their sense of self.